This is a highly mystical and spiritual adventure for those who prefer their metaphysical insights, realizations, and learning to come through light reading, stories, and descriptions of experiences. This story relates a man's quest for Truth and shows his journey from a state of confusion to one of the highest levels of enlightenment and self-empowerment. It is a book that will take you to other worlds and unlimited realms. Deep within the mystical and spiritual practices of India are doors that lead to various levels of both higher and lower planes of existence. Few people from the outside are ever able to enter into the depths of these practices to experience such levels of reality. This book tells the mystical escapade of a man, Roman West, who entered deep into the secrets of India where few other Westerners have been able to penetrate. In what was originally a simple search to find himself after a series of personal upheavals, he journeys to India and gets involved with a prophecy that becomes his inescapable destiny. While living with a master in the Himalayan foothills and traveling the spiritual path that leads to the Infinite, he witnesses the amazing powers the great sages can achieve. He also undergoes some of the most unusual experiences of his life. Under the guidance of his master, and after contending with his own doubts and the limited perspective he has of himself, he gradually opens to new degrees of understanding and awareness, and acquires the power to develop his own supernatural abilities. He then attains the sacred vision of the enlightened sages and enters the amazing and unfathomable realm of Infinity and the vision of cosmic consciousness. Such a description has been provided in very few other places. In the midst of all this, however, his peaceful life in the hills comes to an abrupt end when he is unexpectedly forced to confront the powerful forces of darkness that have been unleashed by an evil Tantric priest who wants to kill both Roman and his master. His only chance to defeat the intense beings of the nether world and to stay alive depends on whatever mystical strength he has been able to develop through the teachings of his master. This brings him to one of the most unexpected battles between ultimate good and evil that he could have ever imagined, and he is right in the middle of it. This story includes traditions and legends that have existed for hundreds and thousands of years. All of the philosophy and teachings, rituals, mystic powers, forms of meditation, martial arts, descriptions of the Absolute and future of the world, are authentic and taken from narrations found in many of the sacred books of the East. Some have also been gathered personally by the author during his own experiences in India and collected from various sages themselves. The wisdom, understanding, and insights that are related, along with the story and situations, make this book one that you will want to read again and again. Some readers have even called it their guidebook. So sit back, put on some of your favorite background music, and ride along with Roman into the mysterious worlds of the sages and mystics, and into the highest levels of spiritual reality that exist everywhere, but so few can see. This book will transport you deep into a realm that you may never have known existed. This book will help prepare you to perceive the multi-dimensional realities that are all around us, outside our sense perception, and will give you many insights into the broad possibilities of our life and purpose in this world, and who we really are. To read the first chapter, click here [ DestinedChapter1 ] . PAPERBACK: It is now published as a paperback book 6"x9", 255 pages, for $16.95. This can be ordered through stores (ISBN: 0-595-33959-X) or easily ordered directly at www.iuniverse.com/bookstore. 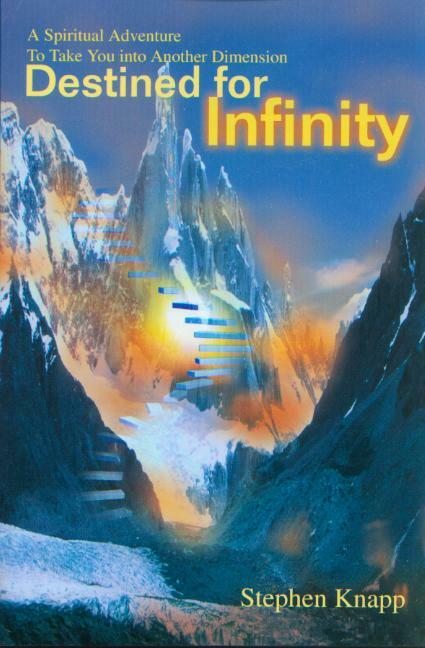 Do a search for "Destined for Infinity" to take you right to the book and order it online. Or simply go directly to the book details page by using this link: www.iuniverse.com/bookstore/book_detail.asp?isbn=0-595-33959-X. International orders can also call: 00-1-402-323-7800. European orders will be shipped out of England. E-BOOK: It is also available as an adobe e-book (for $6.00) that can be downloaded and read anywhere while on your computer, by using this link: http://www.iuniverse.com/bookstore/book_detail.asp?isbn=0-595-78746-0.